Have you ever noticed what a difference a frame can make in how you see an artwork? Since the Renaissance, framing has been an artform in itself. 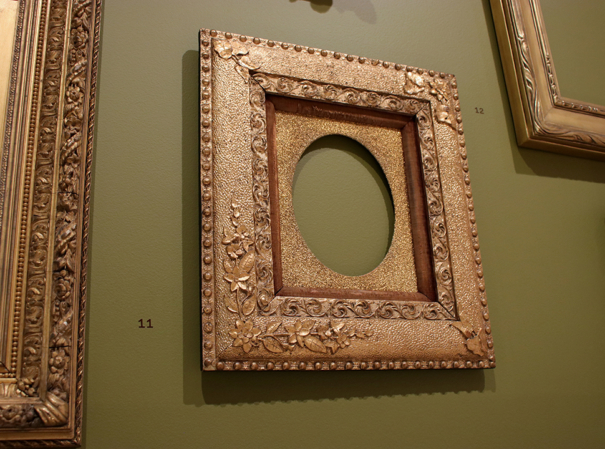 Carved, painted, and gilded frames can not only enhance a painting but also reflect the tastes of their time. This exhibition looks in depth at a selection of American frames from the 19th and early 20th centuries, illustrating key trends and changes which are reflected in the frames on the American still-life paintings in the galleries nearby. Tacoma Art Museum is grateful to Richard Boerth of Atelier Richard Boerth, Seattle for conceptualizing and curating this exhibition. Above: Eclectic photo frame, circa 1890. Wood, gesso, composition ornament, coarse sand, velvet-wrapped liner, oval cardboard mat, gold metal (brass) leaf.